As forecast, I woke to the sound of heavy rain beating down on the tent. I grabbed my breakfast roll bag and headed over to the kitchen. Andy, Mat (German cyclist) and I agreed to meet in the kitchen at 0800hrs for a cookup of eggs and bacon. Scrambled egg, bacon, toast and coffee sure tasted good and set me up nicely for my forthcoming day of wet weather riding. Andy & Mat had both decided that the crap weather was a good excuse for a rest day and they would not be heading out. I on the other hand was conscious that over the last few days riding with Andy I had not been getting enough miles in and would leave myself a mountain to climb if I was to complete the whole ride in my allocated 26 days. I, therefore, had no choice but to pack up and head off. I had full wet weather gear on so it was fine. However, within 2-3 miles I was roasting alive inside my so called breathable goretex jacket and trousers. I think the low 20c temp and the high humidity was the cause of that. I stopped by an information board and started removing the waterproof trousers and jacket. The sand flies don’t take long and were all over any bare skin within a few seconds. 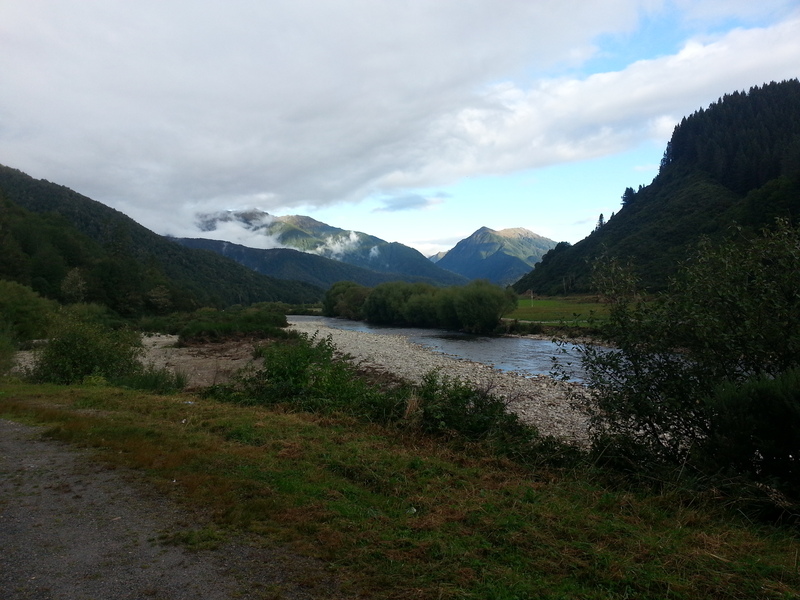 I had to pass over both Maruia Saddle & Rahu Saddle today on my way to Reefton. 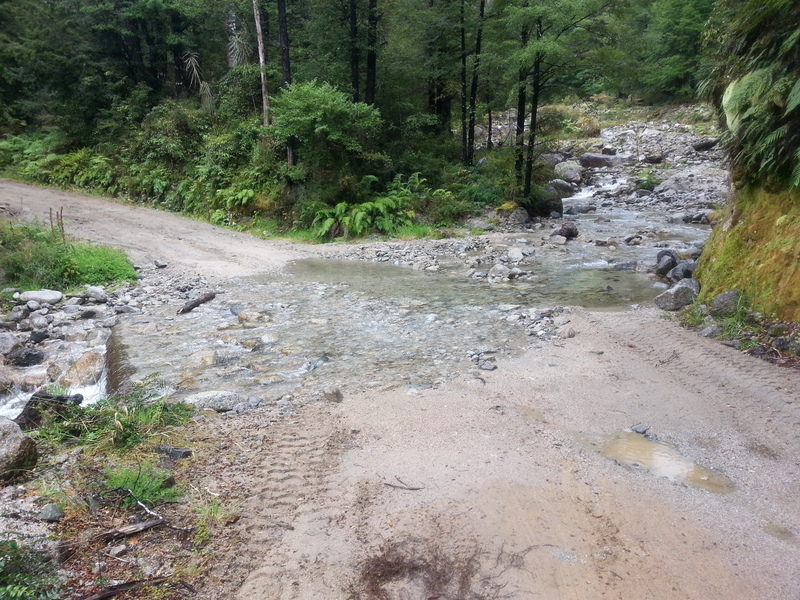 The first part of the ride over Maruia Saddle was off road and involved passing through a fair few streams. This was all great fun and the wet weather was not an issue, however, I had misread my trail notes and the fact that Highway 65 was very busy due to rerouted traffic following the earthquake last year on the east coast and that riders should detour! I joined Highway 65 and started cycling along it oblivious to the fact that within a short period of time I would be scared to death as truck after truck flew by me with little regard for my safety. To make matters worse, the weather had also closed in, turned quite cold and the headwind strengthened. I eventually turned off Highway 65 for a section of gravel riding. By now, I was really cold and wet and pretty much had to put on every layer I could find in an attempt to warm up. Thankfully, it was only a few km to Springs Junction where I was able to get a hot pie from the gas station and to the amusement of people fueling their cars brew up a coffee by the gas station entrance. No naked flames and all that …. 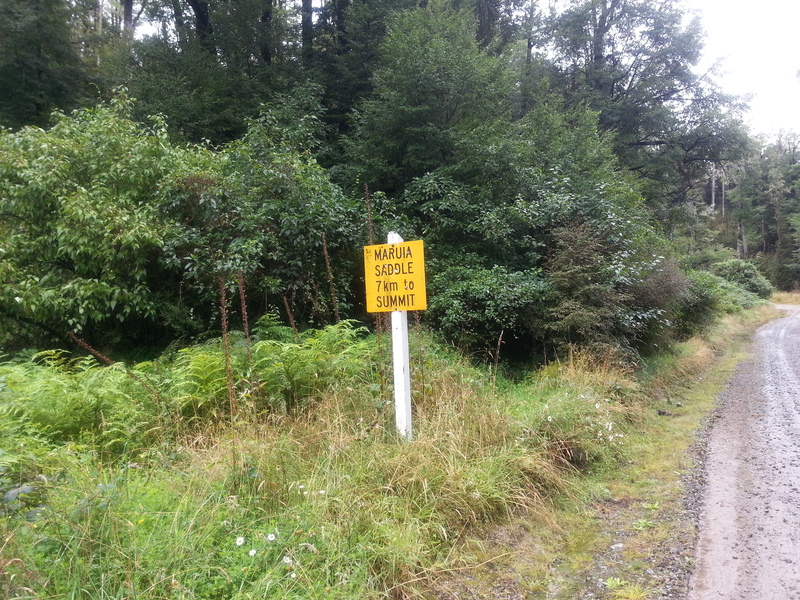 The weather by now had started to improve and the next section to Reefton was on a much quieter highway and one that took me through beautiful forest and had some lovely scenery. I was also warming up and was able to remove a few layers. It was after 1900 hrs by the time I arrived at Reefton campsite and by the time I had erected and dried out the tent, got showered, tumble dried the sleeping bags and changed it was after 2000 hrs. I cycled into town only to find everything except the local bar was closed. So it was a couple of beers and a lasagne for dinner, before heading back to camp and getting my head down for the night.